Resumption of Operation of the Nuclear Power Plant: The government is eager to resume the operation of Onagawa Nuclear Power Plant without plausible safety measures and citizens’ opinions. 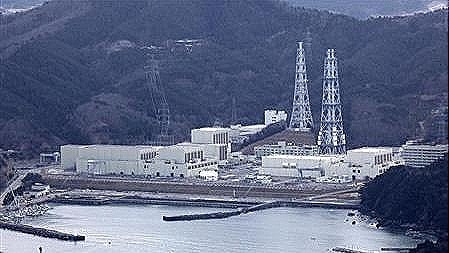 It was not only Fukushima First Nuclear Power Plant to get damaged by the earthquake and the following tsunami but also Onagawa Nuclear Power Plant of Tohoku Electric Power Company was. Onagawa Plant is in Ishinomaki, Miyagi Prefecture. The towns in Onagawa have been also flattened by the quake and the tsunami. Luckily, Onagawa Nuclear Power Plant stopped automatically after the earthquake unlike Fukushima, but the government has already tried to resume operation at the plant, while the local residents are too busy putting their lives back in order to think about it. This is an article on the Chunichi on June 23. I’ll translate it in English below. Oshika Peninsula in Miyagi Prefecture is rich with nature and a beauty spot, where you often see wild deer as its name suggests. Oshika means male deer. Onagawa Nuclear Power Plant is built along the coast. 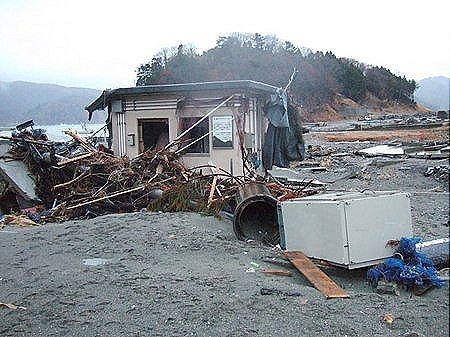 All the villages on the coast were damaged by the tsunami, and some of them were wiped out. A civil servant at the age of 60, who was praying at the remaining shrine on a hill, said, “My house is almost dilapidated. I’m now living in a part of its remaining second floor without electricity and running water,” and looked down at the ground. “I can’t even think about the nuclear power plant in this situation,” he added. That day, Onagawa Nuclear Power Plant was also hit by the big tsunami. It didn’t have a serious damage unlike Fukushima’s, and Tohoku Electric Power Company says that it is because all of its safety measures worked. But it might nothing but sheer luck. 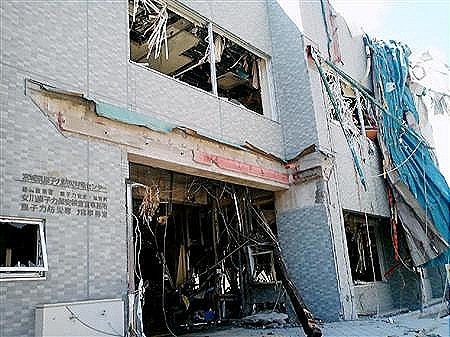 In fact, the earthquake shorted circuit the high-voltage power supply at the first reactor and caused a fire there. Because of that, one of the two emergency diesel generators was impossible to be used. In addition, the second reactor is built nearer the coast than the first one, and its heat exchanging room at the reactor building was flooded. That is why one of the two emergency generators was broken there, too. Moreover, the fuel oil storage tank was destroyed by the tsunami, and the water of the spent fuel pools of the first to the third reactors overflowed by the quake. There were damages above in Onagawa Plant, but a serious “accident” didn’t occur because it could use the external power supply. The height of the tsunami which hit Onagawa Plant was about 13 meters. The expected height was 9.1 meters tops before the quake. The reason why the plant didn’t have a big damage seems that it is located 14.8 meters above sea level. Before fixing the emergency generators, another big earthquake hit the area on April 7th. One of the five lines of the external power supply was being checked and three of them were broken by the quake. They had to operate the facility with only one line. It was a tightrope. That tsunami has also broken four of the eleven monitoring stations for checking radiation dose near the plant. The Nuclear Off-Site Center about 8 kilometers away from the nuclear power plant in Onagawa and Prefectural Environmental Radioactivity Monitoring Center were also flattened. The monitoring center was about 400 meter away from the coast, and was swept away to the sea. They lost two of their staff. Other three including the head are still missing at the office of Nuclear and Industrial Safety Agency. The Mayor of Onagawa Nobutaka Azumi and The City Mayer of Ishinamaki Hiroshi Kameyema are taking a forward-looking stance for resumption of operation of the nuclear power plant, saying “After carefully checking the safety,” meanwhile, the governor of Miyagi Prefecture Yoshihiro Murai says, “It’s unacceptable until the government brings up a new safety criterion.” Tohoku Electric Power Company has announced in public new safety measures, such as building coastal levees and setting three big power-supply units, after the earthquake disaster. Besides, the Economy, Trade and Industry Minister Banri Kaieda requested to resume the operation of the nuclear plant, which is having a regular check now, because its emergency safety planning was being carried out appropriately on 18th. But most of the local people can’t think about it right now. They are spun out on their daily lives. They used to oppose to build the nuclear power plant around 1965 because they were afraid of the radioactive contamination. But the tide changed in 1973 when the oil shocks occurred. The government pushed people to agree dangling subsidies or finance loan when the marine fuel was escalating. After the long-term protest campaign, they decided to have the nuclear power plant in their town in 1979. The plant has brought them great benefit. Inns had many construction workers to stay, the village has received lots of subsidies, and even the gymnastic, where about 650 people are taking shelter now, was built by the subsidy. Hospitals and sports parks were also built by the money. 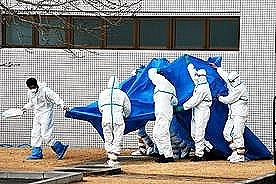 Parents’ Fear for their children of Exposure to Radiation: Children’s nose bleeding…Is it a damage caused by radiation? There has been no indication that things get better at the nuclear power plant in Fukushima yet. Radiation-contaminated range is widening, and people are getting afraid of children’s health even out of the evacuation areas. What can we do for children now? This is my translation of an article on the Chunichi on June 22. “I’m afraid of my daughter because she has kept bleeding at the nose a lot for more than a week…The time was different, but my son also has had a nose bleed for a week…,” a mother, 39, was consulting with the doctor gravely. 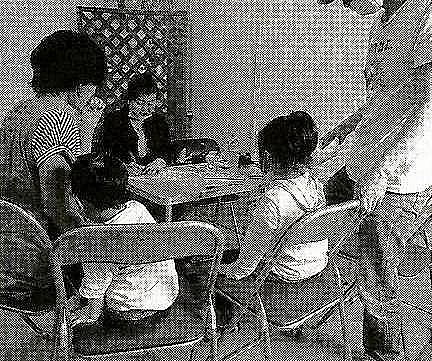 An NPO named Kakehashi to Chernobyl (Cherunobuiri-eno-kakehashi) held a free medical interview in Koriyama-shi, Fukushima on June 12, and 50 pairs of parents and children came there. Koriyama is about 50 kilometers away from Fukushima First Nuclear Power Plant. Mr. Syoichi Hiranaka, 40, took his four-month daughter Sakura to the medical interview from Fukushima-shi. He said bitterly, “She has no symptoms, but I’m always afraid of her health and keep her inside house. What should I do from now on?” Sakura had never seen other people instead of her parents before, and she was scared of the journalist. The radiation counter told 2.33 micro Sv an hour at the shrubbery near the medical interview place. It went down to around 1 micro Sv when it got away a little bit from the ground. The highest was 1.38 micro Sv in Koriyama that day, when the highest 0.0635 micro Sv in Tokyo. Koriyama’s record was 8.26 micro Sv on March 15. The radiation level has been around 1.4 micro Sv since the middle of May. According to the Ministry of Education, Culture, Sports, Science and Technology, they regulate outdoor activities at schools where the measured figure is over 3.8 micro Sv, meanwhile, they set the radiation dosage for children is 1 mSv to 20 mSv per year. Your radiation dosage would go up easily to the level within a year if you lived in a place where the radiation level is 1.3 micro Sv an hour. This is an article of the Chunichi on June 1: There has been no end in sight of the issue in Fukushima First Nuclear Power Plant of Tokyo Electric Power Company yet. Fuel of Unit 1 Reactor has been leaking from the pressure vessel since the accident on March 11, and the contaminated water has been increasing. Unit 4 Reactor’s spent fuel pool is approaching its limit. The power plant is also facing a labor shortage. The subcontracts have been forced to be exposed to radiation without safe control. In the summer, the work environment must become worse. We need manpower. It’s urgent to establish safety management. If you search in some job offer websites on the Internet, you’ll find some information in which places of work are Futaba, or Okuma in Fukushima Prefecture. In those two small towns, Fukushima First Nuclear Power Plant is built. The job information is making no mention of “the nuclear power plant”, but it’s obvious those employment offers must be related to the plant. According to the information, the jobs are operators for remote-controlled robots, electrical workers, and common labors, and so on. The wage is dependent on the job, but it’s around 130,000 to 240,000 yen a month to common labors. It is expected to take a long term to settle the issue and concerned to have adequate human resources for it in Fukushima Nuclear Power Plant. The biggest obstacle, however, is a problem of exposure. Usually permissible exposure level is less than 50 mSv a year and less than 100 mSV in five years, but it has changed up to 250 mSv a year as an emergency measure since the accident. But Ms. Mikiko Watanabe in Citizens’ Nuclear Information Center has declared, “It’s terribly high level and unacceptable.” According to the center, 10 people who used to work in nuclear power plants have already been admitted as victims of industrial accidents. The late Mitsuaki Nagao, one of them, suffered from multiple myeloma. He was exposed to 70 mSv of radiation in about four years. 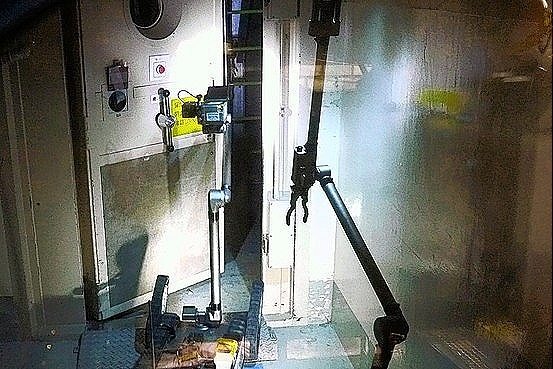 Even a person, who was exposed to 40 mSv of radiation, has been admitted as a victim. It is clear the present scale is how lax and dangerous. According to Professor Takeo Kinoshita of Showa Women’s University, Tokyo Electric Power Company progressed contract work system in 1960’s. Their employees had worked on power poles, but some of them sometimes died from electricity and the workers’ injuries became their problem. Their union has demanded to use contract workers at dangerous places instead of them and then they have started using service contract for dangerous tasks. Mr. Youichi Masuzoe, a member of the Upper House and the former Health Minister, says, “Workers in Fukushima Nuclear Power Plant had insufficient food and place to rest at first. It looked like Imperial Japanese Army.” He pointed out at the Upper House Budget Committee last April that the workers at Fukushima Plant would need to store their own hematopoietic stem cells to save their lives. But the Prime Minister Naoto Kan rejected his opinion and just said, “They should be careful not to exposure to high dose of radiation to prevent that happening.” Mr. Masuzoe is irate and says, “It’s disregard for human life. If the prime minister had to go to the plant, he would pick up cells on ahead. We should never make workers become “kamikaze pilots”.” A worker in his 60’s died from a heart attack at the plant last May. Mr. Masuzoe has stressed the need for emergency medical system as well. Medical front also says the necessity for the workers’ health condition. Professor Masahiro Kami of the Institute of Medical Science in the University of Tokyo, says, “Workers whose parents have had cancers increase anxiety. It’s necessary for them to have medical checkups and counseling. If we had heard from the worker who died from a heart attack on his condition in advance, we might have prevented the attack.” The Health Ministry has established a management office for making a database of workers’ exposure level. But Professor M. Kami has pointed out, “It’s meaningless unless experts check and care the workers.” Professor T. Kinoshita of Showa Women’s University has appealed that the Health Ministry should send the labor standard inspector or set the consultation service. According to a subcontractor, which has sent workers to Fukushima First and Second Nuclear Power Plant, it’s expected to have a labor shortage this summer. There is not another place that hot except for the plant. Goggles are steamed and you can’t see anything there. If the reactors are covered by sheets, the temperature will soar up. No one will be able to stand it. Some construction companies have started declined works related to Tokyo Electric Power Company. Equipments are construction companies’. They don’t want their things to get contaminated by radiation because they can’t use them at other places anymore and TEPCO has never mentioned about compensation. Now workers at the nuclear plant have dosimeters, but they turn them off. If they didn’t switch them off, the alarm would start to ring instantly and they couldn’t do anything. Their protective clothing is ineffective in external exposure. No one write the real number of exposure level on the note. If they wrote the truth, their permissible exposure level would cross the bounds and they wouldn’t be able to work soon. 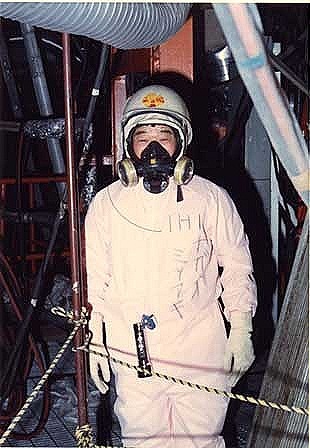 TEPCO used not to use workers in 60’s before, but most of the workers are in the generation now because they can easily avoid having the issue of work related death. The actual condition is common knowledge among workers, but no one appeals that because they are afraid of putting others in trouble. Now workers in the power plant are pinched for money or are driven by a sense of mission. It’s a matter of time there to face shortage of manpower.